I'm obviously not an advertising target for this campaign, because I didn't know anything about it until I saw a display at Winco. For a limited time, you can pay extra to drink Mountain Dew and Pepsi made with real sugar. I remember reading an article a while back about how people travel to a processing plant in Texas to get Dr. Pepper made with real sugar - because real sugar is evidently a smoother taste than the high fructose corn syrup used for sodas these days. 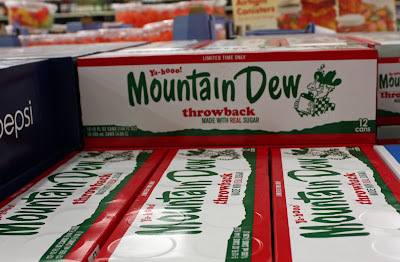 Have you tasted these throwback sodas? My daughter tells me we should abstain entirely from high fructose corn syrup. She alleges it's one of those little foods responsible for a rather disproportionate degree of health woes. At Northern Idaho Costcos they often sell Coca Cola from Mexico. It is in the glass bottle and is made with real sugar. And to be honest it tastes much better. It is really the flavor of pop from my childhood before they put all that cheap and nasty high-fructose corn syrup in everything. I don't care what the commercials by the corn syrup lobby say (not sure if you are getting those in Boise, but they are all over the DC area tv market), high fructose corn syrup is not good for you. Sugar is actually better. Which I realize is a crazy thing to say! Eat food. HFCS is not food.